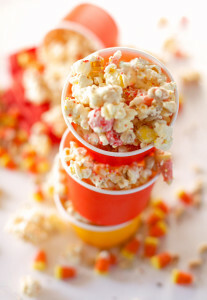 Candy Corn, Autumn Sprinkles, Peanuts and Heath Bits is the combination I chose here. 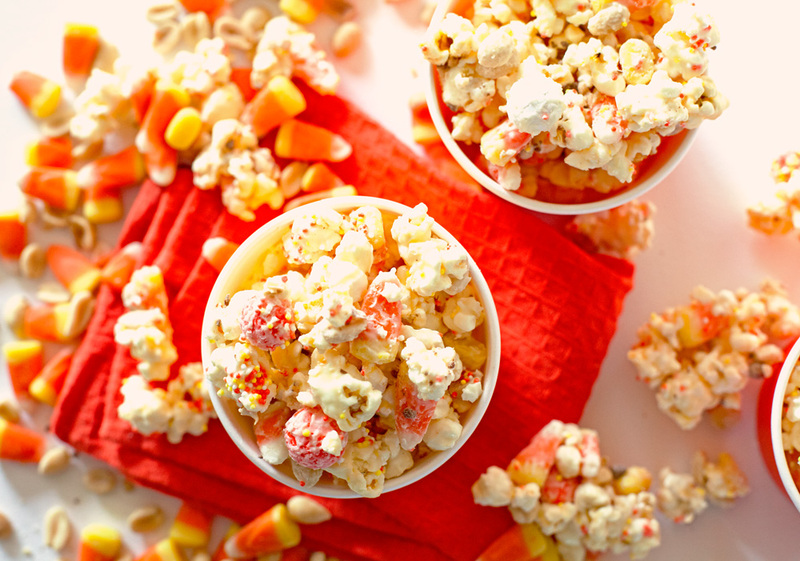 Much like peanut butter and jelly or milk and cookies; candy corn and peanuts are a perfect match. I added autumn nonpareils for color and heath bits for a kick of chocolate. This was so satisfying, but I can’t imagine that any mixture of nuts, candy, or even dried fruit wouldn’t be equally as delicious when combined with the gooey popcorn base. This would also be a great treat to serve at baby showers or holiday parties since you could totally customize the colors and switch up the ingredients according to your theme. So fun! The combination of sweet, salty and crunchy is really what made this mashup sing together so well. We usually enjoy a cup or two of popcorn mix for movie night or on Sundays during football. With that being said, today would be the perfect day to make it. Like I mentioned before, this mix comes together in mere minutes, but if you’re really in a time crunch, you could make the recipe ahead and freeze it in an airtight bag. It defrosts in minutes and tastes every bit as delicious as the fresh kind. Who wouldn’t want to eat cute, mouthwatering and pretty food? 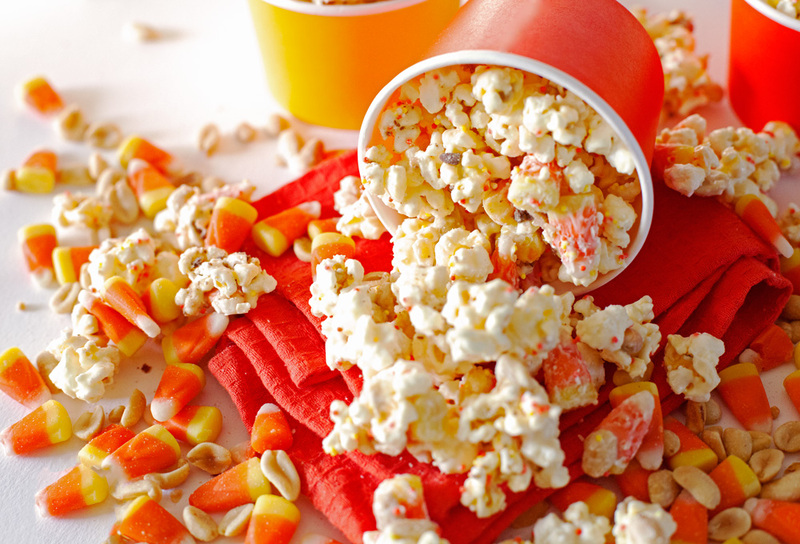 This Halloween Popcorn Mix is so colorful and beaming. It’s like having a ray of sunshine in a cup… which is exactly what we need up here since the temperatures dropped drastically at the beginning of the week. We already had a couple of flurries, sniff. Hope you’re staying warm and cozy this weekend. As always, I couldn’t be more grateful or happier for your support. You all are amazing. Here’s this week’s favorite quote by Maya Angelou. 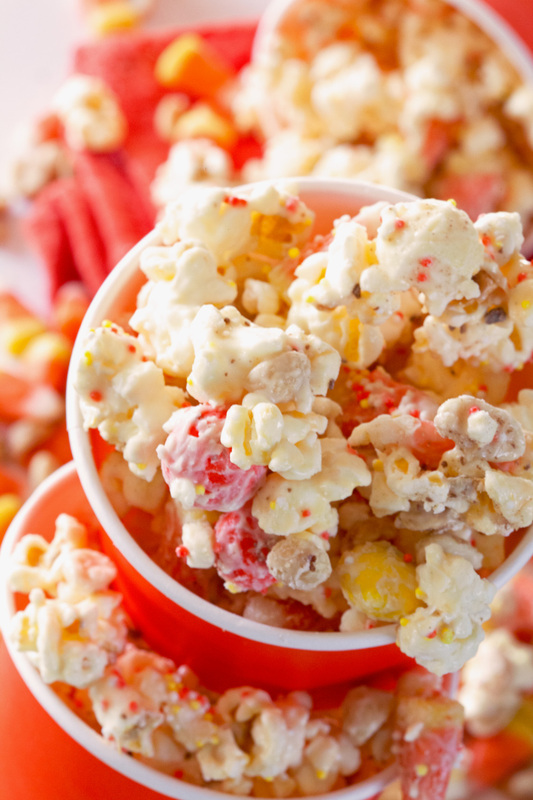 A sweet and salty popcorn mix that is easily customized. 1. 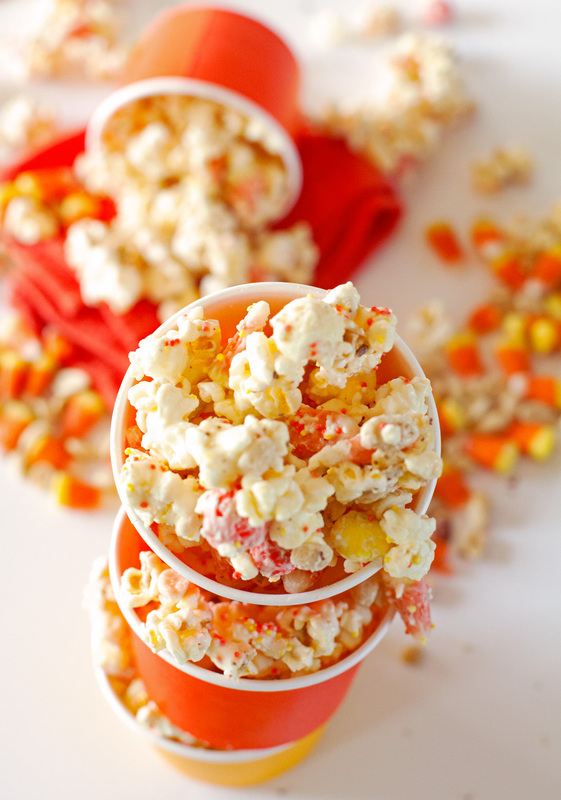 Pop the bag of popcorn in a microwave and pour into a big bowl. 2. In a second bowl, melt the almond bark. You can use a microwave and heat the bark in 30 second intervals until completely melted or use a double boiler. 3. Once melted, pour the chocolate over the popcorn and mix well. Finally, add the candy corn and peanut mixture, heath bits, and sprinkles. Stir to combine and serve. The popcorn mix tastes best if eaten on the same day, but will freeze well in an airtight bag for 2 weeks. Chop up big ingredients into bite-sized pieces before adding to the mix. Sounds sweet and addictive! I love your pics, too! Thank you so much, Gin! You’re right. It’s extremely addictive – I hope you give it a try. Happy Halloween! and the R way to edit the passage without the problems. of what is already-known inside the subject. pronunciation, including carat, caret, and carrot, or even to, two, and too.) are employed in a sentence. be possible to dispute for or against one portion of regulations. seventeenth-century builder A article takes a writer to write the parallels and variations about.